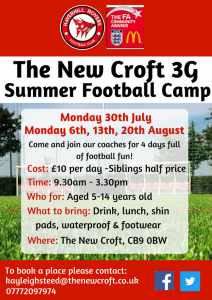 The New Croft is holding 4 days of football fun over the summer holidays, Monday 30th July, and Monday 6th, 13th, 20th August. A great way to keep the kids active and having lots of fun. Sessions will run from 9.30am – 3.30pm, contact Kayleigh Steed to book your places.